Do you love Historical Romances as much as I do? 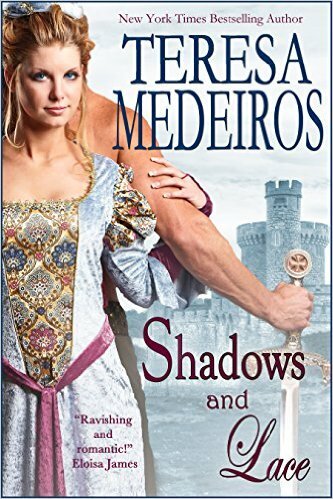 It is my absolute favorite genre and Teresa Medeiros is definitely one of my favorite authors of this genre and has been for many many many years. I actually read this series (for the second or third time) out of sequence but that doesn't matter-they are totally stand alone. I don't know where my original copies are but now they are on my Kindle and I will be reading them again and again. You may find yourself routing Rowena on out loud and grumbling at Gareth. The side characters are all pretty well fully developed and you will love or love to hate them as well. I don't want to tell you too much or I will give it all away and you know I won't do that willingly! You will just have to read it for yourself. Yes, yes! I love historical romances. I can't wait to get my hands on this one. I have lots of friends who love historical romance books. I'll have to share this review with them. I've never read a historical romance, but I do love romance novels. I'll have to give this a look. Thanks! Thanks for sharing! This doesn't quite seem like a book up my alley but something the wife might like. I'll definitely mention it to her. So adding this to my to-read list. Thanks so much for sharing you know all the greatest books! Knights and ladies? Yes please! I haven't read this kind of book for ages! Thank you for the review! I don't read romance novels, but this one sounds intriguing! My mother-in-law would probably love to read this. I do not have time to read-- sadly.. but I will pin this to my Book Love board. I can get into historical romances. I haven't read any in awhile. Sounds like a great summer read. I haven't checked out a great historical romance in quite some time. Maybe I can carve out some space to check this one out. Thanks for the tip! I have not read a romance novel in forever. This looks like one I might check ouy. Sounds like a great book. Wish I had more time to read. I love new books. I haven't read a romance novel in ages. I'll have to check this out. I'm with you, historical romance is my favorite thing to read! Oh, I am definitely ordering this book. It looks great and I'm addicted to historical romance novels. I'll let you know how I like it! For me any genre which has romance in it is very much welcome and thanks for recommending this book I am so reading it. To be honest, this isn't quite my genre however, my mom loves these kinds of novels! I'll pass this on to her! I like historical romance or even a period based story. It leaves a lot of room for creativity and imagination. The settings of this book made me wanna read it. Great love story indeed! I do love historical romances. There is just something about the costumes and the time period that gets me every time. I have always loved historical fictions. Thanks for sharing this review. Sounds like a good book. Ah the old adage to have to give the heart. :) It does sound like a great book to spend the weekend with...perhaps in a hammock or on the beach! I'm not a big fan of romantic novel, but this one seems very interesting. I think I will be looking into it. Thanks for sharing. Sounds like a great read! I always love a good historical romance book. Ooooo this sounds like a goodie!!!!! I've been looking for a new book to read while chillen poolside! This may be it! This sounds like an awesome historical love story. I really love stories like this and so does my mom. Thanks for sharing.